(New York) – Aging men and women are the most rapidly growing group in US prisons, and prison officials are hard-pressed to provide them appropriate housing and medical care, Human Rights Watch said in a report released today. Because of their higher rates of illness and impairments, older prisoners incur medical costs that are three to nine times as high as those for younger prisoners. The 104-page report, “Old Behind Bars: The Aging Prison Population in the United States,” includes new data Human Rights Watch developed from a variety of federal and state sources that document dramatic increases in the number of older US prisoners. 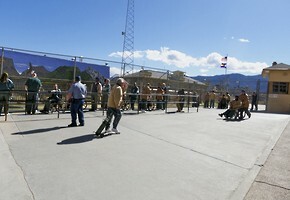 Human Rights Watch found that the number of sentenced state and federal prisoners age 65 or older grew at 94 times the rate of the overall prison population between 2007 and 2010. The number of sentenced prisoners age 55 or older grew at six times the rate of the overall prison population between 1995 and 2010. Long sentences mean that many current prisoners will not leave prison until they become extremely old, if at all. Human Rights Watch found that almost 1 in 10 state prisoners (9.6 percent) is serving a life sentence. An additional 11.2 percent have sentences longer than 20 years. Human Rights Watch visited nine states and 20 prisons to interview prison officials, corrections and gerontology experts, and prisoners. Human Rights Watch found officials scrambling to respond to the needs and vulnerabilities of older prisoners. They are constrained, however, by straitened budgets, prison architecture not designed for common age-related disabilities, limited medical facilities and staff, lack of planning, lack of support from elected officials, and the press of day-to-day operations. 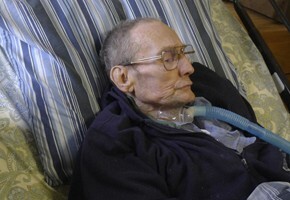 While serving time in prison can be hard for anyone, it is particularly challenging for the growing number of older prisoners who are frail, have mobility, hearing, and vision impairments, and are suffering chronic, disabling, and terminal illnesses or diminishing cognitive capacities, Human Rights Watch said. Prison facilities, rules, and customs were created with younger inmates in mind, and they can pose special hardships for those who are well on in years. Walking a long distance to the dining hall, climbing up to a top bunk, or standing for count can be virtually impossible for some older prisoners. Incontinence and dementia impose their own burdens. In the prisons with high proportions of elderly prisoners visited for the report, Human Rights Watch found that staff behavior has had to adapt to the realities of aging bodies and minds. The number of aging prisoners will continue to grow, Human Rights Watch found, unless there are changes to harsh “tough on crime” policies, such as long mandatory minimum sentences, increasing life sentences, and reduced opportunities for parole. Many older prisoners remain incarcerated even though they are too old and infirm to threaten public safety if released, Human Rights Watch said. “How are justice and public safety served by the continued incarceration of men and women whose bodies and minds have been whittled away by age?” Fellner said. Modify prison rules that impose unnecessary hardship on older inmates. The number of US state and federal prisoners age 65 or over grew at 94 times the rate of the total prison population between 2007 and 2010. The number of prisoners age 65 or older increased by 63 percent. The total prison population increased by 0.7 percent. There are now 26,200 prisoners age 65 or older. The number of US state and federal prisoners age 55 or older nearly quadrupled between 1995 and 2010, growing by 282 percent, while total number of prisoners grew by less than half, 42 percent. There are now 124,400 prisoners age 55 or older. As of 2010, 8 percent of the prisoner population was 55 or older, compared with 3 percent in 1995. The proportion of prisoners age 55 and over varied among individual states from 4.2 percent in Connecticut to 9.9 percent in Oregon. Fourteen percent of federal prisoners are age 51 or older. Of state prisoners age 51 or older, 40.6 percent have sentences ranging anywhere between more than 20 years to life. One in ten state prisoners is serving a life sentence. Fifteen percent of state prisoners age 61 or older have been in prison more than 20 years. In New York,28 percent of those age 60 or over have been in prison continuously for 20 or more years. Eleven percent of federal prisoners age 51 or older are serving sentences ranging from 30 years to life. There is no federal parole. Depending on the state, medical expenditures for older prisoners are three to nine times as high as for other prisoners. In Florida, the 16 percent of the prison population age 50 or over accounts for 40.1 percent of all episodes of medical care and 47.9 percent of all hospital days. In Georgia, incarcerated people age 65 years or older had an average yearly medical cost of $8,565, compared with the average of $961 for those under 65. In Michigan, the average annual health care cost for a prison inmate has been estimated at $5,801; the cost increases with their age, from $11,000 for those age 55-59 to $40,000 for those age 80 or older. Number and proportion of older prisoners and their sentences: In addition to national statistics, the report contains data for 24 individual states with particularly detailed information for California, Colorado, Florida, Louisiana, Missouri, North Carolina, Ohio, Pennsylvania, and Virginia. Medical Expenditures for Older Prisoners: The report contains data on prison medical expenditures in California, Georgia, Michigan, Nevada, North Carolina, Oklahoma, Virginia, and Texas.